Use 800-8000 grit sharpening stones for sharpening, with the 800 grit stone for the actual sharpening process. In the following steps, you only remove the scratches that were created during sharpening. To make sure you do not damage the back of the razor, we recommend that you tape it up. Caution: If you guide the razor with the blade at the front, you will cut the strop! This paste (No. 709019) is normally used for razors which are already in regular use to delay the basic sharpening or to make the blade even sharper for the daily shave. Before shaving, we recommend polishing the razor on the cotton side of the hanging strop with the aluminium oxide-based polishing paste, followed by un-pasted stropping on the leather side. Rub a small amount of paste evenly onto the cotton side of your hanging strop. Then work the paste thoroughly into the cotton surface of the strop, using the heel of the hand. The cotton should absorb the paste so that there is minimal coating on the surface. Wipe any excess paste off the surface with a rag or paper towel. 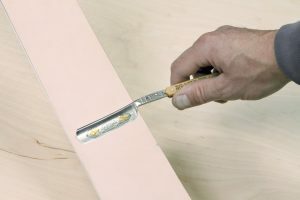 As with all sharpening pastes, a strop surface coated with a particular grit size or abrasive should be dedicated to that grit size or abrasive alone. 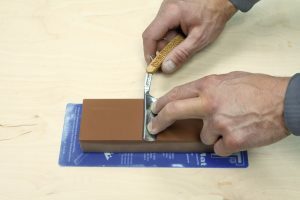 You can reuse this strop surface later for a larger-sized grit, but never for a smaller-sized grit. The motion used on the pasted surface is identical to that used on the unpasted leather side.